I remember my first exposure to meal planning. I was 13, and had a pretty sweet after-school gig sitting for a couple of younger kids in my neighbourhood. All I had to do was get off the bus with them, and we played games and read books until their parents got home an hour or so later. Easy peasy. On the fridge of this family, there was a laminated menu indicating what dinner would be had on what night. It was the same every week (i.e., chicken tuesday, taco wednesday, etc.). This seemed weird to me. I couldn't imagine wanting to eat the same thing week after week after week. So I always thought THAT was what meal planning was. That it wouldn't allow any spontaneity and that it meant one would be doomed to endless repetition of the same dreary old things. Totally not my thing. And now of course, we have all of these blogs and planning websites telling us we can cook once a month and then take a break from the kitchen. I'll be honest, those sites kinda scare me, with their uber-organized alpha personalities cooking up 20 lbs of ground beef and chopping 50 lb of vegetables when they return from the grocery store, all to end up in an endless sea of labelled and vacuum-sealed ziploc (yes, I exaggerate). That's not my thing either. So with trial and error over the last few years, I've got *my* way of meal planning. It's low-key, it's flexible, and it works, regardless of how simple or complex you want your meals to be. First, I check the freezer to see if there's stuff I'd like to use up. This week, I decided I wanted to use up osso buco, stewing beef, chicken, and some of my Supperworks order. In my fridge, I had kale that needed to be used, along with leeks, and in the pantry I have squash and potatoes that I should get to. I absolutely LOVE Pinterest for pinning stuff that looks intriguing. I try to make sure that the text of my pin has some of the recipe keywords, and then I'll just go to my food board, and use the find function to browse through recipes containing my main ingredients (i.e., chicken, pasta, kale, etc.). You should totally follow me on Pinterest. Once I've got my recipes, I systematically write down the ingredients I need (and group by section of the grocery store --> produce, grocery, dairy, bakery), then I check the flyer of my local store to see what's on sale, and add things like fruits and veggies and staples to the list (for example, pineapple was 3/$5, so we got pineapple this week). I also usually write down one baking-type recipe so I have muffins or something like them to put in Lil Z's school snack (whole wheat pumpkin spice latte muffins this week. I also made these AMAZING lemon-coconut raw bites. I'm scheming as to how I can make them nut-free so Z could take them to school....I'm thinking pepitas and shelled sunflower seeds...). And voila. It takes about 20-25 minutes over a nice cup of coffee and then I have a plan for the week. And it's different every week; no boring, no repetition, no huge amounts of advance prep. Don't get me wrong, I admire those who do all that prep, but I frankly don't have my schmidt together to do that when I get home from the store. I also don't plan for lunches, because I eat leftover dinner from the night before for lunch. Or, because I'm on mat leave, I'll just have something like a tuna sandwich, or eggs. I keep it simple. You could make it even simpler - there are meal planning companies like the Fresh 20 that will email you meal plans every week for a small fee. I don't need this now, but I love the idea for when I go back to work. I'm particularly intrigued by this company because it's only 20 ingredients, and it's all natural, whole foods. If anyone has tried it, I'd love to hear your feedback. Oh, and the cool meal-planning notepad? You can find it here. I love it! Not necessary, but cute, and it makes me feel all organized. Edited to add - you can also get the notepad at Chapters (I've seen it in-store as well). For Canadian readers, this is probably way cheaper when you take shipping into account. Anyway, that's how I do it. And there's no reason you couldn't recycle plans; it's just not my style. Hope you find it helpful! Holy smokes--I have one of those notepads, and it has osso buco on it too! Great approach - I've been trying to do this more lately, some weeks work better than others so far. I'm glad you mentioned where you got the notepads too! Looks good. Sunday mornings are my weekly meal planning sessions over a cup of strong coffee :) We have our menu board posted on the entrance wall to the kitchen. I like that you guys also use a FFY - Fend For Yourselves night - keeps it flexible. I've been using that notepad for a few years now ... its great! The company also sells one for grocery shopping that is amazing -- I've finally got hubby trained well enough to mark stuff off the list when we run out over the course of the week. If he doesn't do that, and then complains that we're out of something I'm like "Too bad, sucker ... should'a checked it off the list!". Oh, and I always purchase those lists from Chapters. 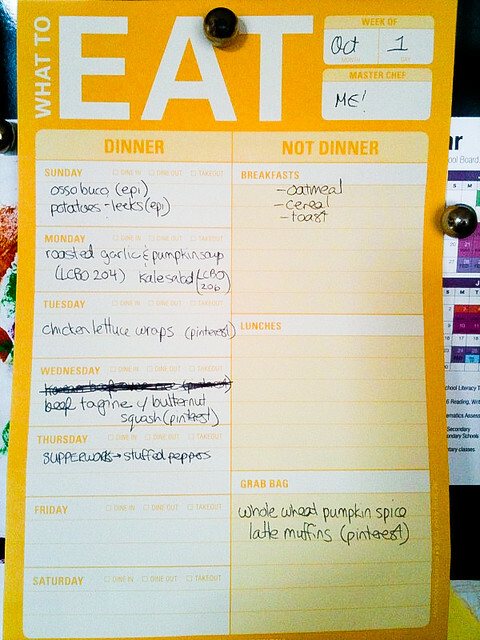 Without actually using that specific notepad - this is pretty much EXACTLY how we meal plan at our house. For now, we "post" our menu electronically (shared document on GoogleDrive.. the kids can't read yet). I write out my meal plan on a blackboard I have in the kitchen but I do like that notepad! JennU - great minds think alike! Melanie - I updated the post; you can get them at Chapters. Jenny - gotta keep things flexible. I can't handle too much rigidity! Andra - I'll have to check out the grocery one! Rebecca - I had never actually considered doing it online...but it makes total sense, because you could refer back to it later. SMART. Brent - I also love the idea of a kitchen blackboard. Sadly, I'm lefthanded, so blackboards are a personal nightmare of mine, but I think it's such a good idea; if you have nice handwriting, it would look like a restaurant!